A charming, Portuguese-style hotel which enjoys a fantastic location for a beach holiday between Calangute and Baga. The two pools and extensive gardens mean there’s always somewhere to relax and soak up the sunshine. Baga can get very busy with domestic and international tourists. Plush, colourful gardens filled with coconut palms and bright bougainvillea, two peaceful swimming pools and well-presented, white-washed buildings help bring the Colonia Santa Maria to life. Its peaceful setting offers guests a welcome oasis away from the hustle and bustle of Baga, providing the best of both worlds. The guest rooms at Colonia Santa Maria are located in bright white villas scattered throughout the four-acre gardens, with either beach, pool or garden views. They’re designed perfectly in-keeping with Goa’s Portuguese heritage, and each room is comfortable and spacious. Modern facilities including air-conditioning and tea and coffee-making facilities also provide an additional level of comfort. Found between two of North Goa’s most popular resorts, Baga offers a bustling and vibrant atmosphere with all manner of bars, restaurants and nightlife to keep you entertained, or instead head a little further south to Calangute, where a slightly more laid-back vibe awaits, yet still with lots of restaurants and bars to sample. Goa is famous for its beautiful, palm-lined beaches, and a holiday at Colonia Santa Maria offers almost direct access to the endless strip of golden sand between Baga and Calangute. There are lots of colourful, makeshift beach shacks lining the shore, so you can enjoy not only some afternoon refreshments, but you’ll have the opportunity to do some souvenir shopping too. Colonia Santa Maria offers a fantastic base for couples and groups of friends looking for a beach-themed escape, which you can make as lively or a relaxed as you wish. These spacious air-conditioned rooms have a small lounge area and come with a balcony or terrace. They are located in villas throughout the hotel grounds. 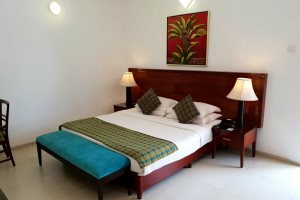 These spacious air-conditioned rooms have a small lounge area and come with a balcony or terrace as per the Superior Rooms. They are located in villas throughout the hotel grounds with views of the beach or the pool.